Ninth Circuit US Court of Appeals held that police may not taser a motorist who poses no legitimate threat to the safety of others. A federal court last week handed down guidelines that limit the ability of police to use tasers at will. The Ninth Circuit Court of Appeals made its decision in response to a 2005 incident where Coronado Police Officer Brian McPherson tasered and injured motorist Carl Bryan, then 21, over a minor seatbelt infraction. The court described in detail how Bryan had spent the morning driving 180 miles from Camarillo to Coronado only to be stopped by the highway patrol for allegedly speeding on the 405 Freeway. Bryan, upset by being hit with an expensive ticket, forgot to buckle his seatbelt before continuing on his journey. When Bryan reached the Coronado bridge at 7:30, Officer McPherson was waiting with a “Click it or Ticket” trap designed to collect $84 seatbelt violation tickets. Bryan knew he was about to get a second citation in the space of a few hours and grew upset with himself. He pulled over and turned down his radio in compliance with McPherson’s orders, but Bryan began swearing at himself as he stepped out of his car and stood next to the door. McPherson claimed he felt “threatened” by Bryan, who stood in his boxer shorts looking away from McPherson some distance away. Without warning, McPherson shot Bryan with his 1200-volt taser. Bryan fell face first into the ground, shattering four of his front teeth. In addition to his injuries, Bryan was hit with charges for “resisting arrest” and “opposing an officer in the performance of his duties.” Bryan sued McPherson and the police department, claiming his rights were violated by the use of excessive force. Prosecutors were unable to convince a jury to convict Bryan of the crime often known as “contempt of cop,” and a district court judge found that the use of the taser was unlawful. On appeal, a three-judge panel of the Ninth Circuit agreed that McPherson should not be immune to the lawsuit because his actions were objectively unreasonable. 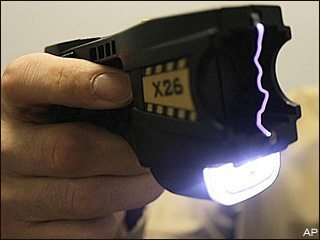 The court held that even though the X26 model taser used is portrayed as a “non-lethal” tool for police, the device has been known to cause death and significant injury. For that reason, its use must be limited to cases where it is absolutely necessary. “We hold only that the X26 and similar devices constitute an intermediate, significant level of force that must be justified by a strong government interest that compels the employment of such force,” Wardlaw wrote. Having decided against McPherson, the court remanded the case to the district court to continue proceedings on the federal Section 1983 lawsuit. A copy of the Ninth Circuit decision is available in a 110k PDF file at the source link below.